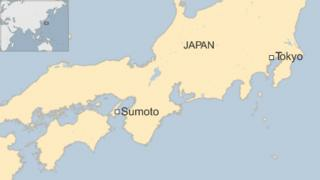 Five people have died in a stabbing attack in the western Japanese city of Sumoto, local media report. A 40-year-old unemployed man was arrested for allegedly attacking the victims at a farmstead early on Monday morning, according to police. Japanese media have named the attacker as Tatsuhiko Hirano. Reports say he was found with blood on his clothes and initially admitted to the killing. Police found the bodies of two women in their 50s and 60s and the body of a man in his 60s at one house at the site. A couple in their 80s were found dead in another building nearby. The attacker lived in the neighbourhood with his father and grandmother, reported Jiji Press. Locals said he had rarely left home. The city of Sumoto is located on Awaji island, in the Hyogo prefecture.